Cyalume Chemlight 1-1/2" Mini Light Sticks give light for 4 hours and are very small and compact enough to fit anywhere. For the size, these mini light sticks are very bright and a dependable source of emergency lighting for 4 hours. Cyalume mini light sticks are a clean and non toxic choice to illuminate any area. These 1-1/2" mini light sticks are very safe when operating near gas, oil, or combustible materials. Cyalume mini light sticks come in four colors and last up to 4 hours after activation by simply striking a hard surface. Cyalume light sticks are perfect for homes. In case of blackouts in hospitals, schools, nursing homes, offices, hotels, trains and industrial sites these are great for distribution to employees. 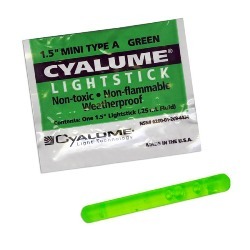 Police departments, fire departments, EMS, utilities and government agencies purchase Cyalume mini light sticks. They are used in remote locations, confined space, and at crime and accident scenes. There is no need for batteries or bulbs. In addition, environmentally there are no risks when Cyalume light sticks are disposed. They will work in sub-zero temperatures and have a shelf life of 4 years. Made in the USA and sold in cases of 50.